A few weeks ago, Jeremiah & I took a little day trip to Yosemite. The first time we ever visited was around this same time of the year, but it was completely covered in snow. This time, it still looked like Autumn out there. I tested out my new lens & the different functions on my camera. My brother’s been teaching me a few tips & tricks lately on Photoshop. I always want to go back here when it’s covered in snow, but this place is so beautiful regardless of the season. It wasn’t as cold as I had anticipated, but I wore my earmuffs anyway since I haven’t been able to wear them all winter. Jeremiah & I definitely want to come back here during the summer & go camping. For some reason, our camping plans always fall through. Who is actually down?!?!?!?!? Photos of Yosemite on 35mm film. More photos from this roll here. A couple of months ago, I mentioned in this post that I bought a film camera at a thrift store for $4! I finally finished the test roll, got it developed, & this is how the shots turned out. Jeremiah & I definitely made some focusing mistakes by not locking in the subject before taking the photos. I don’t mind the mistakes I made because I’m always eager to learn—it’s the only way I can get better. These are all poorly scanned by me because I didn’t know how they were going to turn out. It was a test roll, after all. I didn’t want to pay the extra $ for a CD file if nothing turned out great. I’ve mentioned it in past posts before, but I still feel like I should mention it because Foto Express in Downtown San Jose, CA always does a great job with my photos. They often are able to process my photos the same day or the next day vs. Walgreens or CVS, which could take up to a week. I also prefer Foto Express because I like the quality of their CD scans & they sometimes stay open later so you can pick up your prints. I normally get my photos on a CD file at Foto Express, but with this being a test roll, I opted not to get a CD because I didn’t want to pay the extra $ if nothing turned out right. Without the CD, I decided to just scan them at home on my Canon PIXMA MG3222. For this test roll, I used a Fujifilm Fujicolor Superia X-TRA 400. My brother, Jeremiah, & I went to Yosemite National Park a couple of weeks ago in hopes that it would be covered in snow. There wasn’t that much snow, but we still tried to make the most of our trip. Since this was a quick trip for the three of us, we didn’t put as much thought into our plans. I decided to make a list of tips that I plan to use for the future. If you plan on visiting, this list could help you too. 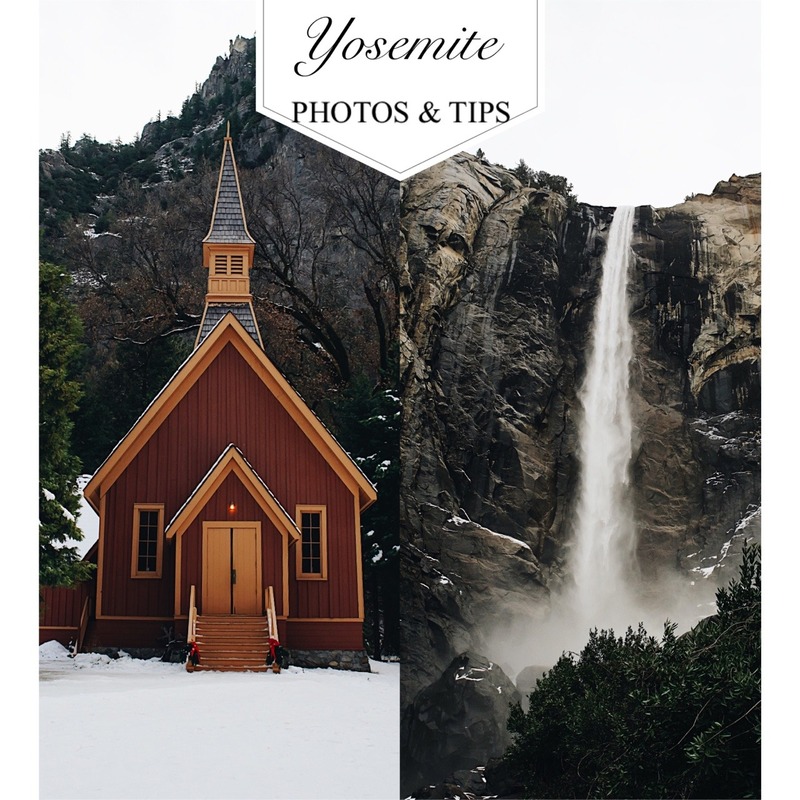 Inside Yosemite – There are a few choices if you wish to stay the night inside of the park. If convenience is what you’re looking for, you can book a lodge or cabin at these locations. Also, there are camping sites available for the truly adventurous. Outside Yosemite – If you’re willing to drive a little bit outside of the park, there are a good amount of hotels & lodges surrounding Yosemite. Most of them offer free wi-fi & surrounding food venues. Airbnb Outside Yosemite – I personally feel this is the best option if you’re going with a larger group. Splitting the cost of Airbnb for the night is cheapest way to go, & you can also save money on food by cooking your own food. Like hotels, most Airbnb’s will offer free wi-fi too. Shoes – I cannot stress this enough, please bring a good pair of hiking shoes/boots. No matter what time of year you’re going, you’ll need comfortable shoes on your feet to do the best hikes/trails. Water/Snacks – Staying hydrated is super important. I recommend bringing a good amount of water on your trip. A hydroflask or similar type of water bottle will keep your water at the perfect drinking temperature! Also, keep your energy up by bringing granola bars or sandwiches. Adventures do get strenuous, so please make sure to stay hydrated & fed. Backpack – You’re going to want a backpack when visiting Yosemite. It should be big enough to carry your essentials (water bottle, snacks, travel first aid kit, camera, etc. ), but not so bulky that it will hinder your movement. Pack as light as you can, while still bringing the necessities. Cellphone Service – There were some areas of the park where my phone was able to pick up signal, but you’re better off just expecting no service at all. Besides, it’s more fun to just focus on enjoying the park! Traffic & Crowds – If you go on a holiday weekend, you can expect a bit of traffic. If you want to avoid that, there is a shuttle service that brings you to various parts of the park. The easier trails & most popular views will also have bigger crowds, so be prepared for that. Parking – Parking inside of the park is limited, so the shuttle service is also a big help when it comes to this. Tunnel View – This is one of the biggest tourist attractions in Yosemite, so get here early if you want to catch the sunset. Also, to get a better shot, try looking for a spot higher up from the parking area. Bridalveil Falls – This trail is a breeze. It’s an easy walk to the falls, but it does get crowded at times. The view of the water is spectacular though. The morning after Christmas we woke up at 5AM with very little sleep to head towards Yosemite National Park. We didn’t have a chance to do anything over his birthday weekend because that weekend & every one after that was full of events so we decided to delay it for a weekend that best fit both of our schedules. We really just wanted/needed a small getaway for just the both of us. & the only weekend that worked best was Christmas weekend. We’ve been meaning to go here for over a year already & we’ve always wanted to experience it in the snow. Thankfully it wasn’t snowing so we were able to handle the cold weather without all the extra harsh conditions. The requirement by the park is that you need to have snow chains on if your car isn’t a 4-wheel drive. Jer bought snow chains at O’Reilly’s a couple of days before we left for $40 so everything worked out. We only did two small hikes that I wouldn’t even really call hikes. It was more of a nice walk. We did the Lower Yosemite Falls hike & the Mirror Lake hike. They weren’t strenuous at all. We both wanted to do other hikes, but we aren’t familiar/experienced with hiking in the snow so we decided to play it safe & do the easier ones. Yosemite is dreamy, beautiful, & gorgeous. I loved it there. I didn’t want to leave. I do want to go back before all the snow is gone. Hopefully if I have a weekend cleared up in January I’d be down to go again for a day trip with my brother & our cousins. We stayed at Cedar Lodge which is a little drive away from Yosemite because all of the lodges inside of the park itself were a little too expensive. Cedar Lodge also has a cute breakfast diner & then a Bar+Grill next to it. They have an outdoor pool, an indoor heated pool, arcade, activity center for arts+crafts, etc. Our room was also pretty cool because we had a shower & a bathtub with jets 0_0 Wasn’t expecting a lodge to have that. The only downside is that the area where the lodge is located doesn’t have any signal. They do have wi-fi! Not having signal out there was kind of tough, but the wi-fi kind of just did it for me because there are plenty of other alternatives to reach me at besides text or call. Besides, you don’t want to be too attached to your phone. The whole point of going away for a while or being around nature is to immerse yourself in all of it. You want to experience all the beauty around you & not be so attached to your phone that you miss out on everything. I’d definitely go back! I already miss it so much. I posted a couple of teaser videos of what it looks like over there. Check out my previous posts!